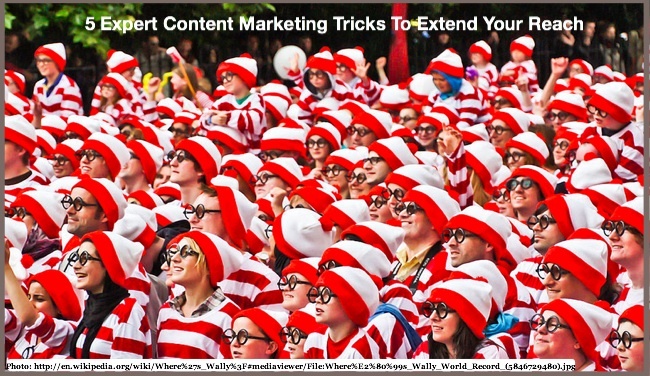 Content marketers are always on the lookout for new tricks to engage a larger audience. The major challenge is to consistently break through and attract both dedicated and new readers in an increasingly competitive environment where time is readers’ most scarce resource. The key to improved reach is a compilation of small tactics that in aggregate create a big impact. It’s the same for the pros. You just don’t see what they’re doing because, like a “Where’s Waldo” cartoon, they’re hiding in plain sight! 1. Maximize your blog post emailings. Most bloggers blast an email to their housefile every time they publish a post. Often, it’s just the blurb and a link to drive reader to the entire piece on their website. 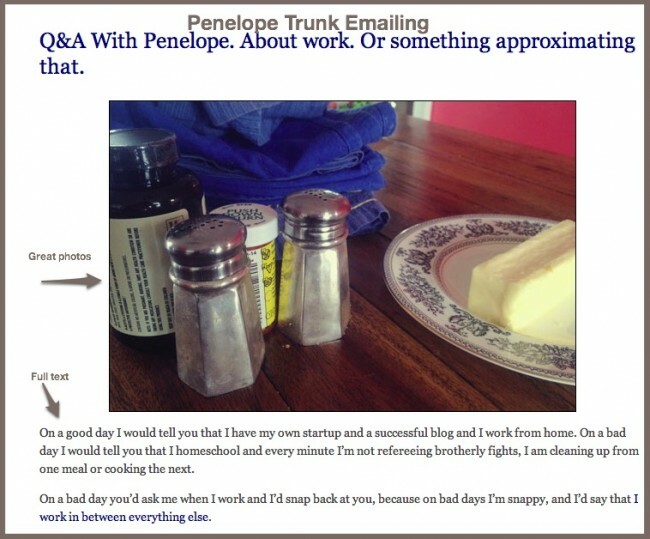 Some bloggers, like Penelope Trunk provide the whole enchilada. This is a good first step but with a little extra work and a paid email provider (I use AWeber) you can take your content marketing distribution up a notch. Razor Social’s Ian Cleary goes a step further. He writes a short tailored email with his friendly Irish personality so that it’s more than just a push email. Further, he promotes the current blog post and a related one from the past. 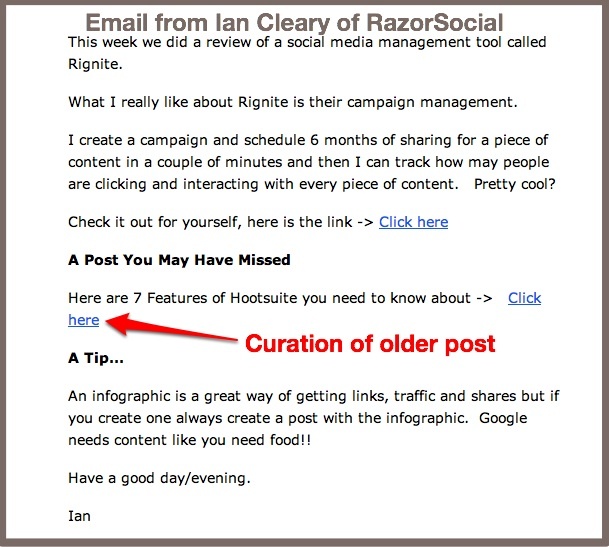 This is a great way to curate your own content and extend the life of older posts. Promote older, related posts. To this end, it’s useful to have a content audit and to augment your content with appropriate metadata. Think owned content curation. Add your personality to your emailings. Readers like to know about the person behind your blog. Trunk made a point that regardless of how frequently or infrequently she writes, her traffic is about the same. 2. Extend your content reach with SlideShare. Don’t limit SlideShare to being a filing cabinet for old PowerPoint presentations. SlideShare can handle most content formats. Rather create a related, visual version of your content for SlideShare to attract attention and drive additional readership to your main content. 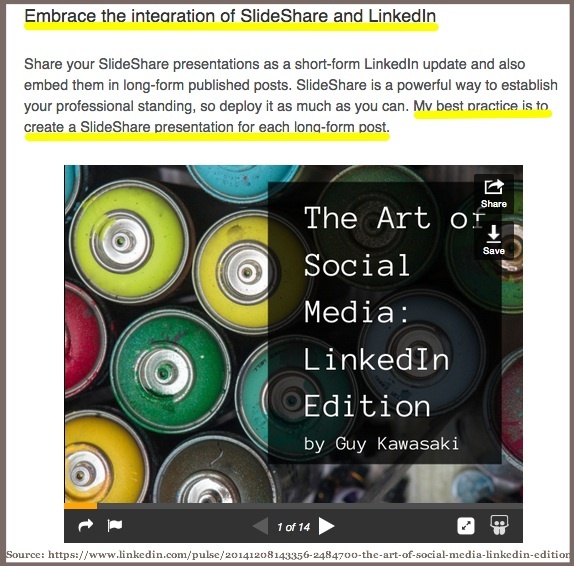 Guy Kawasaki, an original member of LinkedIn publishing, shared that he always creates a related SlideShare to extend the reach of his content. (Here are some helpful guidelines for using LinkedIn Publishing.) BTW—Kawasaki also focuses the information he posts on LinkedIn to a few select topics. Bill Flitter of Dlvr.it publishes his company’s blog posts as PDFs on SlideShare. While no one article hits more than a few hundred views, collectively, they providesa wider audience than just emailing the company posts because SlideShare notifies his connections. Incorporate cross-channel complimentary content, where appropriate. This speaks to the need to maximize the promotion of every piece of content. Tailor your content based on the specific platforms. One size does NOT fit all. Include call-to-action in every piece of content. Determine what you want your reader to do next and direct him to that specific action. When you say, “live events” and “content marketing” together most people think conferences. Yet the reality is you don’t need to think that big. Live events are powerful because they give you an opportunity to build relationships with people face-to-face. Orbit Media’s Andy Crestodina hosts a Wine and Web every month. These monthly gatherings enabled Orbit Media to build a community in Chicago for their key demographic. When I taught at NYU, I ran a speaker series. It was a win-win. My students got exposure to well known marketers and many of the speakers got a chance to meet potential employees. Take a page from Peter Shankman’s playbook. Shankman travels extensively and tweets out where he is. It’s a great way to meet new people and take advantage of otherwise filler time. Test out live events. Ask your LinkedIn or Twitter friends to meet you at a local bar or coffeeshop. Plan other related content. Use the opportunity to at least create photographs or short videos for sharing. If you’ve got bigger events create related content. 4. Say it out loud with a podcast. 2014 was a turning point for podcasting. Mike Stelzner has been talking about podcasting for a while. 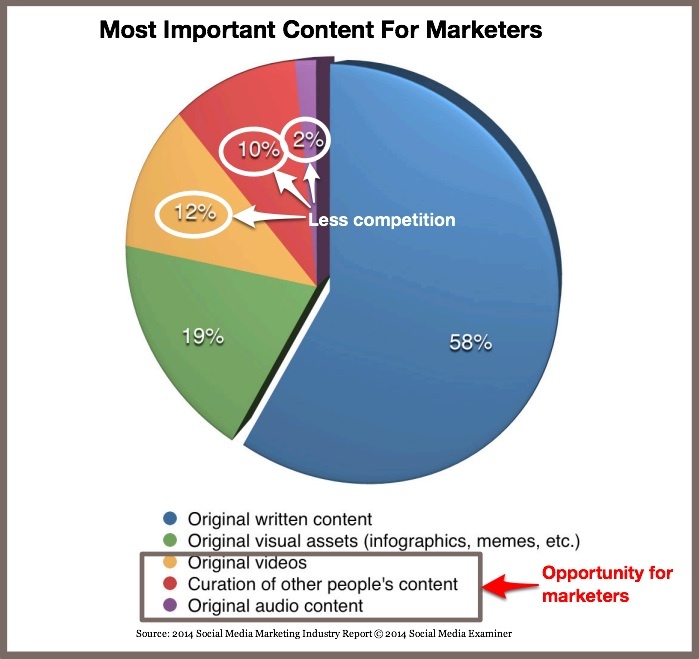 In fact, Social Media Examiner’s 2014 research spotlighted the opportunity for creating audio content via a podcast. Content Marketing Institute expanded its audio content by rolling out a series of podcasts. 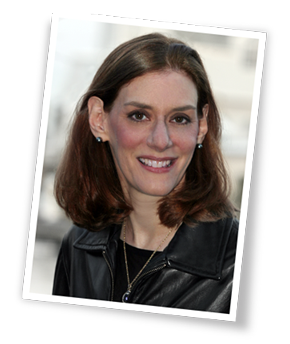 Pamela Muldoon, who got her start in terrestrial radio, heads up their efforts. If that’s not enough to convince you, Convince and Convert’s Jay Baer launched MarketingPodcasts.com to help you navigate the audio marketing waters. Start listening to marketing podcasts. As with a blog, the objective is to figure out what you like and don’t like about other people’s podcasts. Test the podcast waters. Be a guest on other people’s podcasts. Alternatively, take another cue from Ian Cleary who has added audio snippets to his blog posts. Create a podcast strategy. Take the time to plan the type of content you want to present and related branding. Set goals, understand your audience and establish metrics. 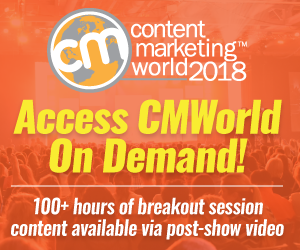 Jay Baer introduced a 3 minute video earlier this year. He creates a new video 3 times a week. (Notice the 3 thing going here.) The videos are posted on his blog as well as on YouTube. Additionally, he promotes them in his email newsletters. Baer records the videos on his smartphone. He also reuses the content in other forums. 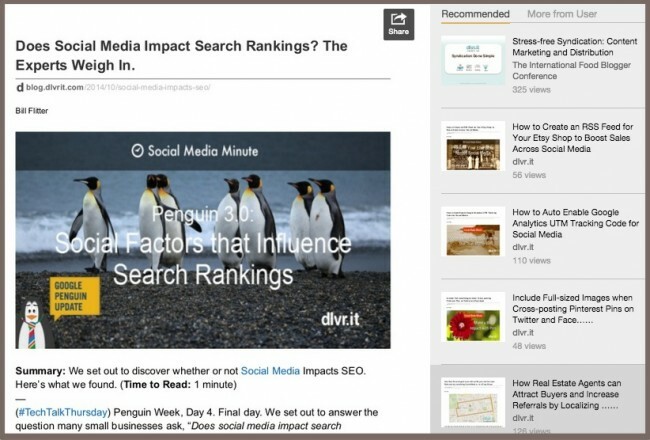 To maximize the impact of these 5 expert content marketing tricks, test them one at a time. This way you can incorporate them as part of your on-going content marketing and measure the results. 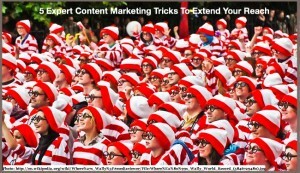 What other content marketing tricks would you add to this list and why? Tags Andy Crestodina, Bill Flitter, Ian Cleary, Jay Baer, Mike Stelzner, Pat Flynn, Penelope Trunk, Peter Shankman, Tim Washer. Bookmark the permalink.